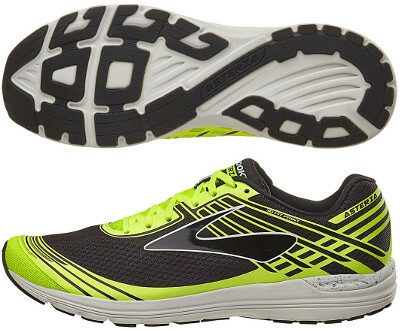 Brooks Asteria are stability racing running shoes. The versatile Brooks Asteria is a shoe for fast runs (although not as radical as the incredibly light Hyperion) with some stability support. Worthy heir of the legendary ST Racer 5, its (relatively) wide last and enhanced stability provided by double density in the heel make the Asteria a great choice for fast workouts like intervals and racing up to marathon. Upper is made of two-layer breathable mesh enabling runners to wear it sockless, something really appreciated for triathletes as well. Fused overlays (3D Fit Print) provide secure fit while padded tongue guarantees comfortable feel with tight laces. Major feature in midsole is the double density in the heel (Guide Rails) for improved stability. Rest of midsole is BioMoGo DNA foam already seen in other Brooks models like Launch 3 which provides outstanding response with firm but soft feel. Full ground contact outsole is focus on quick transition and fast toe-off raising some concerns about its durability.